Ugh intimidation. 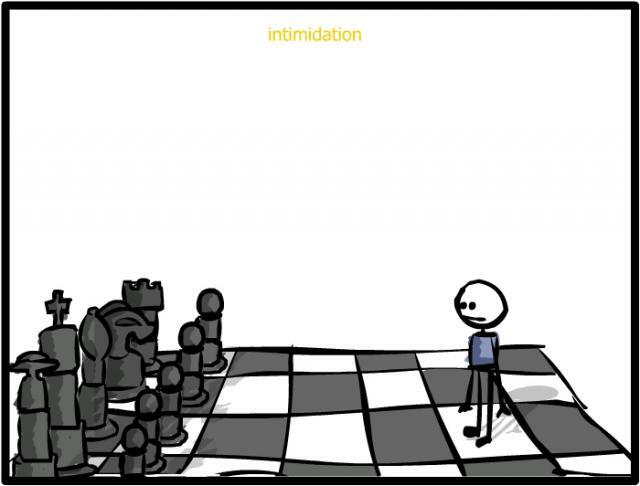 I hate the thought of being intimidated but (in my opinion) it is just one of those natural things in life. At some point we are all intimidated by something or someone. Some of us are intimidated by man things or many people. My intimidations have lessened over time because of the strength I have built over time. I am no longer intimidated by the woman with the better body than me or the woman I might think if better looking than me. Those things are just superficial and exterior. They don’t define us as people…once I realized and accepted that, those intimidations ceased. My biggest intimidation though is people that are aggressive and (in my own words) outspoken. I am not saying that these are negative qualities by any means. Let me explain… The people I am speaking of are the ones that can speak their mind at any time. They express all of their emotions with ease and portray confidence in what they say and feel. These are the people that will express their opinions and feel confident in what they say and do not care whether or not they offend anyone…because they feel as strongly as they do. I admire these qualities (sometimes) but I am also intimidated by these qualities. Don’t get me wrong…I can hold my own. I can speak my mind and state my opinions. I have just always been the person to tread lightly and consider other’s feelings before voicing my opinions…no matter how passionate I feel about something. From a young age I was always taught to not be aggressive. I don’t blame my parents…they didn’t want me to be a bully. I understood where they were coming from. It is such a tricky thing to teach a child. There is this find line between being aggressive to get what you want and being abrasive and rude. A lot of people fall into the latter. I still struggle with this and when I come in contact with people that are able to speak their minds with such ease and say whatever they want when they want, I can become completely intimidated. I feel like I am not conveying my point clearly…hmmmmm. I am a woman with a lot of book smarts and a lot of “street” smarts. I believe I flow well in day to day life and I work hard and I am able to get the results I am looking for. I can sell myself in interviews and I can speak very passionately about certain topics. I, however, have this shyness inside of me. I HATE HATE HATE the thought and idea of offending people…even if it is a perfect stranger. I am constantly thinking in my mind whether or not I have been guilty of the same thing I would be pointing fingers at someone else for. I question myself a lot when it comes to expressing my thoughts because I know with some things I have not learned all there is to learn. I cannot tell someone they are wrong because I don’t feel like that is my right. I have made many mistakes in the past by talking about people (yes behind their backs) and I have lost friends by doing this (yes, it was my fault). I expressed my thoughts with a third party instead of the party at hand. I know this is wrong (trust me I know). I just never know how people are going to react. I always want to keep the peace…even if I don’t necessary agree with what others say and do. I have a fear of losing people in my life so I just keep my thoughts to myself. I am very uncomfortable with confrontation. I witness people all of the time that are the complete opposite. They will say and do what they want when they want. This is one area in which I am still searching for that happy medium. I would like to be more aggressive in certain ways but I do not want to be aggressive to the point of being unlikeable or unapproachable. I hate to feel intimidated by people…especially people that (in my opinion) are very negative and selfish. There is another fine line between being there for others and being there for yourself. I know there are times when I destroy myself by not speaking my mind and by not standing up for myself. This blog has helped in a big way…even though there have been times I have even felt intimidated here (by people that live FAR away from me…which is crazy). It is a given that some people will not like me or will not like what I think or say…it is one of those things that sometimes I have a hard time accepting. I have difficulty dealing with someone that expresses their dislike for me, my thoughts or my actions. I have such a strong desire to be liked and I have this passion inside me for good so when someone says something negative on my behalf I feel completely lost…completely intimidated. This may sound odd, but occasionally I intimidate myself. As a writer, I’ll come up with my “what ifs” (plot lines/stories) and the potential success of any “what if” scares the crap out of me, because WHAT IF I can’t create anymore successful “what ifs”? Guilt or the pondering if we are guilty, is intimidation. Why be intimidated by your own mind? Oh, I’m preaching to me. I guess for many of us this is a very sensative subject! I raised a similar issue in my blog of Dec last year……..Is sarcasm really funny? The piece I wrote about was with regards to a male work colleague. Someone who found enjoyment at putting others down and imtimidating them with barrages of sarcastic and hurtful comments. Like yourself I don’t like confrontation, and the majority of the time I put up and shut up…..for fear of saying totally the wrong thing in response. I stop and question myself if I were to confront them with similar insulting or intimidating remarks….would this make me any better than them? I really don’t think so….it would only put me on the same level as them (and make me feel a sense of guilt) Over the years I have learned to compromise, and be tactful. Having been a Union Representative for over 10 yrs, this was an essential tool. However, having said that I did have a confrontation last week with this same young male colleague over his very highly opinionated, egotistical, and very harsh remarks and critiscism of others as well as of me. Suffice to say, alternative seating arrangements in my office have now been made, where upon I do not have to constantly hear his extreme opinions, which are to him are always right. He has ‘a natural flair’ to be intimidating, sarcastic and egotistical, and I do believe he finds this a strength of his own character. He is still very young, and has yet a great deal to learn, like you and I and many others have already learnt…. the art of diplomacy…….and the difference on how to share an opinion rather than have it forced upon others, in the belief that he is totally right so no one else could possibly be. I’m intimidated by the writing world. Trying to break in is so hard and I know you need a tough skin. Thanks for the good read! I am also intimidated by people who can speak their minds freely without minding at all what you’d think. Usually, these people are also good looking, making them doubly intimidating for me. I used to think that these people were rubbing in my face how much better they are, but now I realized that it was just a feedback, a comment, or a start of an intellectual discourse. Now, I try to level with them. When they say something that hurts me, even just a little, I say “thank you,” instead, then walk away.